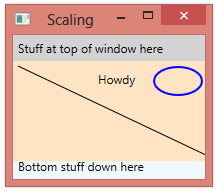 A ViewBox is typically used to scale a panel containing other elements. One common use of a ViewBox is to scale the contents of a Canvas panel. We might include several elements within a Canvas that has an explicit size. 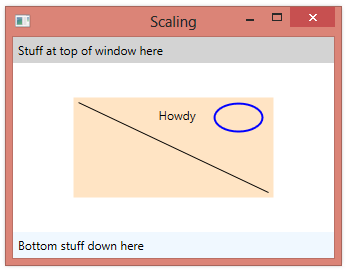 If we re-size the window, however, the canvas stays the same size. We could have had the Canvas stretch to fill the remaining area, but its elements would still be the same size. We can get the elements within the Canvas to scale by wrapping the Canvas in a ViewBox. Content="Stuff at top of window here"
<Line X1="5" Y1="5" X2="195" Y2="95"
<Ellipse Height="30" Width="50" Stroke="Blue" StrokeThickness="2"
Now when we resize the window, everything within the Canvas is scaled. 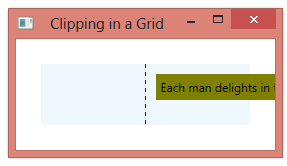 A Grid will normally clip child elements within each grid cell so that the element will not extend beyond the bounds of the cell. In the example below, the Label in the second column is clipped to the right side of the column. Content="Each man delights in the work that suits him best." 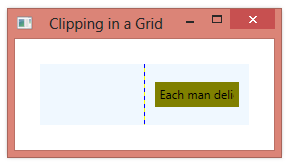 Background="Olive"
If we want to prevent the Grid from clipping the element, we can do this by placing the element in a Canvas, which we then put into the Grid. Because a Canvas does not clip child elements, this will allow the element to extend beyond the boundaries of the Grid. <Label Content="Each man delights in the work that suits him best." Background="Olive"
By default, the Canvas panel does not clip its child elements at the boundaries of the Canvas. If the child element does not fit entirely within the Canvas, it will extend beyond the edge of the Canvas. If we place the Canvas in a large enough Window, the Canvas will be large enough to contain the Label. 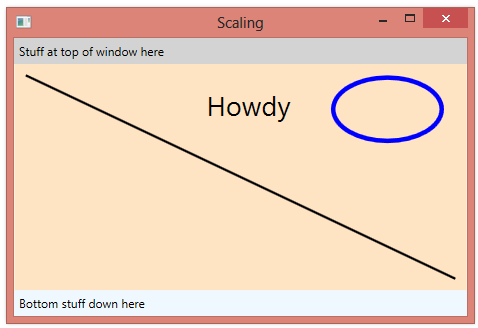 If we now make the window smaller, the Canvas will become smaller and the Label will extend beyond the boundaries of the Canvas. Note, however that the Label will not extend past the edge of the Window. You can replace the default StackPanel used as the items panel for a ListBox with any other panel element. If you have items that you want to display at arbitrary locations, you can use a Canvas for your items panel. The example below presents a list of cities, where each city is placed at its proper latitude and longitude. The end result is that the city names are displayed at their proper locations on the canvas. 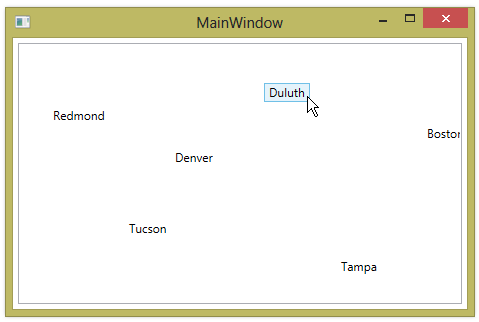 Note that because the cities are displayed in a ListBox, we can still select one of them. Because the ScrollViewer control is a ContentControl, it can contain any single element. It most often contains a single Panel, which in turn contains child elements. 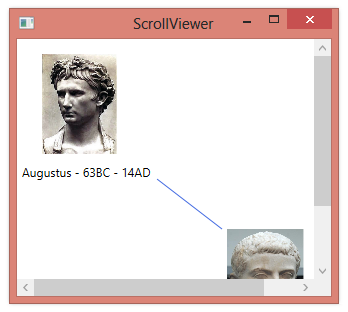 Below is an example of a ScrollViewer that contains a Canvas, which in turn contains several different elements. 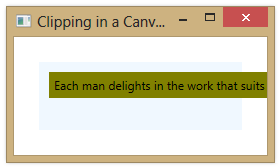 When the containing window is sized to be smaller than the Canvas element, the scrollbars automatically appear. <Line Canvas.Left="140" Canvas.Top="140" X2="65" Y2="50"
The different Shape elements (e.g. Ellipse, Line, Path, Polygon, Polyline or Rectangle) describe a shape to be drawn using an X,Y coordinate system, with X increasing from left to right and Y increasing from top to bottom. 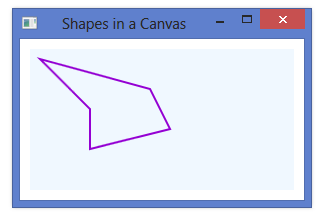 When you add Shape elements to a Canvas, the coordinates specified for the elements are used to determine the element’s position within the coordinate space of the Canvas. 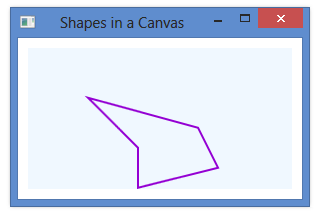 For example, a point in a shape at (0,0) would be located in the upper left corner of the Canvas. <Polygon Points="10,10 60,60 60,100 140,80 120,40"
If you set any of attached properties for positioning with the Canvas (Left, Top, Right, Bottom), these properties will be used to offset the entire shape, relative to one (or more) of the sides of the canvas. Points="10,10 60,60 60,100 140,80 120,40"